Melanie stood in the center of her living room and tried to empty her mind of all thoughts. She lunged forward with her right leg, bent her right knee, arched her back, reached high with her hands, and breathed slowly and deeply. Usually this yoga warrior pose made her feel strong and invincible, as if the power of the universe were coursing down her arms and throughout her body, but today she felt only disbelief. Could I have killed Nancy Garcetti? Yesterday morning, she’d gone outside to do a few stretches in the bitter pre-dawn air to wake her sluggish mind and prepare for her last marathon day of writing. Shivering from the cold and still groggy from a mere three hours of sleep, she made the unforgivable mistake of not paying attention to her surroundings. A hand touched her shoulder, and a woman’s voice whispered in her ear. “I know you killed your husband.” Without thinking, Melanie spun around, leading with her elbow, and caught the woman beneath her chin. The woman’s head snapped back. She staggered. Fell. Melanie stood over her, breathing hard and trembling from the adrenaline rush. When she got control of herself, she held out a hand to help the woman up. The woman ignored the offer of assistance, staggered to her feet, and hissed, “You’ll be sorry.” By then Melanie’s eyes had adjusted to the gloom, and she recognized the real estate agent. Melanie took another breath and tried to focus on her warrior pose, but she couldn’t get Nancy out of her mind. The last time she had seen Nancy alive, the woman had been tottering up the street. Could she have managed to get as far as the house with the Santa, then crawled against the blow-up figure for protection against the quickening winds, and died there? Melanie hadn’t struck the woman with the full force of her strength, so that jab couldn’t have killed her. But perhaps Nancy hit her head on one of the rocks lining the driveway and bled into her brain. She wished Alexander were there so she could ask him about the possible effects from such an injury, but he if were still alive, she wouldn’t have had the brief and possibly deadly altercation with Nancy. Oddly, last night when she found the body, she hadn’t made the connection to her tussle with Nancy, but had assumed the real estate agent’s death had been outright murder. It wasn’t until she woke at three o’clock after a short fitful sleep that the horrible thought took hold. Could I have killed Nancy Garcetti? Melanie lowered her arms to her side, straightened her knee, and pulled her left leg even with her right. She stood still, feeling lost. Alexander was dead. She’d finished her book about Morris Sinclair’s ignoble life and gruesome death. She’d even finished the book about the Mojave Desert Alexander and she had been working on when he was killed. Now the only thing left for her to do was to find out who had assassinated him. And she didn’t know where to start. The sound of a distant voice caught her attention. The voice sounded tinny, as if from a cheap radio. As it grew louder, she could make out the words. “We are coming up on the house of Morris Sinclair, but first you will see where Melanie Gray lives.” By then the voice was blaring, sounding as if it were right outside her door. Melanie ran upstairs to look out her office window. A bus idled in the middle of the street, a banner draped across its side—DESERT DEATH TOUR. Bland faces peered through the windows. Melanie gasped. Black Widow? Is that what they were calling her? Did people really believe she killed Alexander for his wealth? What wealth? He had no money. In fact, after he was gone, their publisher had insisted she finish the desert book by herself since Alexander had spent their advance. And he hadn’t died by her hand. Someone skilled in the ways of death had cut all four metal brake lines in his car so that when Alexander slammed on the brakes, he instantly lost hydraulic pressure in both the front and rear brakes at the same time. The sheriff had told her that with today’s vehicles, cutting the brakes that way is almost impossible for a professional to do, and completely impossible for an amateur. She certainly couldn’t have done it. But she could have killed Nancy. Her gaze followed the road to the house where she’d found Nancy’s body, and she saw a wisp of smoke. She wondered if the people who lived there had made a fire to cozy up to. If she had a fireplace, that’s what she would do today. This was a perfect weather for sitting in front of a fire, watching flames dancing, thinking of nothing. Then she realized the smoke was coming not from the chimney, but from the house itself. And flames glowed in the windows. She ran down the stairs, fumbled for her cell phone, and tried to call 911, but she had no signal. She dashed outside. The tour bus was idling in front of the Sinclair house and the guide was giving a surprisingly ungarbled version of Morris’s death. Of course, the truth—that the horror writer had been killed and dismembered in a way that mimicked his stories—was hard to top. A little boy pressed his face against the window, mouth open, tongue out, and stared at her. “Where’s your mother?” Melanie shouted. The youthful gargoyle crossed his eyes and disappeared beneath the window. The bus let out a belch, then moved on down the road. It stopped in front of the burning house, and the occupants craned their necks toward the spectacle. It took Melanie a moment to recognize her neighbor. Moody Sinclair had cut her long dark hair and dyed the shorn locks a strawberry blonde. Chandelier earrings dangled from her ears and eyeglasses perched on her nose. She looked pretty and normal and very young. “Fire.” Melanie said absently, listening to the siren in the distance. The siren grew louder as the fire truck turned onto Delano Road. The driver honked the horn as it sped up the street. All the dogs in the neighborhood added their howls to the cacophony. Melanie scrambled to the side of the road, losing track of Moody, who had dashed to the other side of the street. Now that the firefighters had arrived, there was no reason for Melanie to continue toward the scene, but she found herself drawn to the action. As Moody had said, the structure of the house wasn’t burning, but flames bursting through the windows made it seem as if the place were wrapped in fire. Even standing apart from the crowd, Melanie could feel the heat. The blow up figure of Santa on the motorcycle slowly melted, then dissolved into a puddle of red, white, and black. Whatever remained of the crime scene after the sheriff’s department had finished with it was now gone. Could the house have been torched for that very reason—to destroy evidence? But in that case, why not just burn the Santa and his environs? Melanie backed away from the inferno. This really didn’t have anything to do with her. If she had killed Nancy, the real crime scene lay several houses down Delano Road. She headed back to her rental house, wishing she could leave this benighted area. Then suddenly she stopped short. She could leave. She had money enough to go anywhere. The real problem was figuring out where to go. If her reputation as a Black Widow followed her, then what difference did it make where she lived? 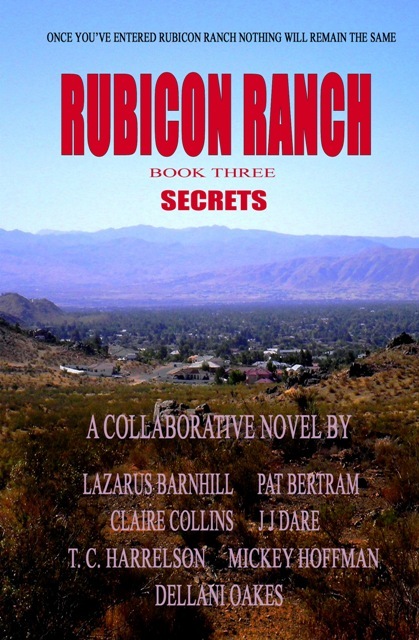 At least in Rubicon Ranch, she was just one of many stops on a desert death tour. Besides, Alexander had been killed not far from here, so this is where she needed to begin her investigation into his murder. blood on the rocks, but that didn’t prove her innocence. It only meant no one could find any evidence against her. Unless someone had seen her hit Nancy? She looked around. Everyone in the neighborhood—residents and squatters alike—seemed to have congregated up by the fire. Only one woman trudged past her house, looking as if she could handle anything or anyone. Hefty, with biceps like hams poking out of a sleeveless top. Bleached blonde hair that looked heavily permed. Cigarette dangling from a bright red mouth. Melanie smiled to herself. Compared to all the necorphiliacs and vampire-wannabes on the loose in the neighborhood, this woman seemed almost elegant. But then, perhaps she really was a fine lady on the downward swing of life. Who knew what lay behind anyone’s façade? Everyone had secrets. Everyone had things they wanted to hide from view. But still, if Nancy had died because of her, who had stolen the real estate agent’s purse, and who had set the fire?